In Harlem’s historic Sugar Hill district there is a wealth of black history housed in a quaint corner brownstone at 419A Convent Avenue. There you will find the renowned Essie Green Galleries, home to artworks by African American artists, such as Jacob Lawrence, Romare Bearden, Lois Mailou Jones, and Norman Lewis. Sherman Edmiston is President of Essie Green Galleries, and is one of the most respected dealers of Black Master works in the United States. He is a Harlem native, graduated from City College with an engineering degree, and earned his MBA from Baruch. Edmiston pursued real estate and art dealing in Manhattan and Brooklyn, and in 1979 he helped to open his first gallery in Park Slope, Brooklyn. Early in his career, Edmiston fueled his passion for art by dealing works from and representing artists of West Indian descent. Edmiston stayed in Brooklyn for many years, during which time he met the famed artist and historian Romare Bearden. Bearden strongly encouraged him to deal Master works by African American artists. Bearden’s suggestion to deal works by Harlem Renaissance artists and others, coupled with Edmiston’s intense affinity for his hometown, inspired him to move Essie Green Galleries to Sugar Hill a few years later. For Edmiston, Harlem’s spirit, culture, and location are perfect for sustaining the mission of the Essie Green Galleries. Edmiston has successfully represented African American painters and the masterful works they have produced. He aims to educate art collectors and the local community about what Black art has to offer. Moreover, Edmiston seeks to affirm Harlem’s rich history and the African American cultural legacy through his work..
Black art is not just black-themed work. Today, the art world has defined Black art to be art produced by artists of African decent. Jean-Michel Basquiat, of the 20th century, remains a popular reference of Black modern artists. Today, names of Black artists like Kara Walker, Mark Bradford, and Wangechi Mutu from Kenya continually grace the pages of preeminent art journals and blogs. Edmiston lauds these budding artists’ achievements, and confirms that they have the potential of being “propelled into higher stratospheres” in terms of fame and price points. However, the Essie Green Galleries collection shines a bright light on more obscure black artists. 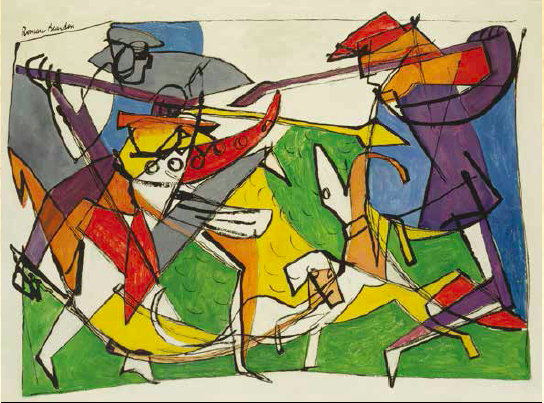 Most people would readily associate the abstract expressionist style with painters like Mark Rothko, Jackson Pollack, and Willem de Kooning. 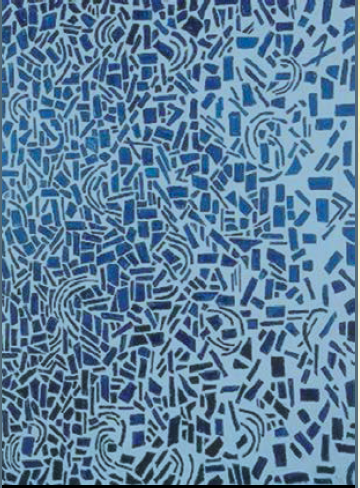 But Edmiston also invites you to consider Alma Woodsey Thomas, an African American who was considered an painter (and also the first woman to present a solo exhibition at the Whitney Museum of American Art). Thomas’ piece Babbling Brook and the Whistling Poplar Trees Symphony (1976, acrylic on canvas, 72″ x 52″) substantiates why she was so revered in her time, and currently showing at the Essie Green Galleries. 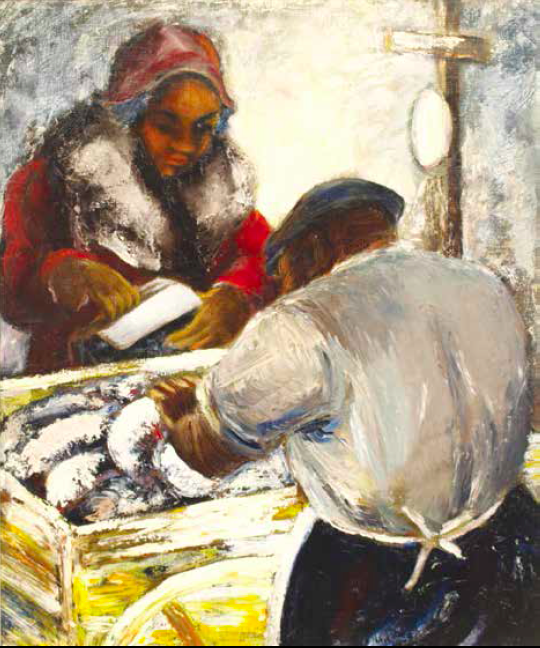 Charles Alston’s Fish Market (circa 1959/60, oil on canvas, 24″ x 20″) currently inhabits a cozy space in Edmiston’s gallery as well. Alston was a Harlem Renaissance artist and muralist who lived, studied, and worked in Harlem. A Black Master, indeed — Romare Bearden was a painter, art historian, songwriter, and author. His painting The Uncoupling of the Hounds (1946, oil on board, 25″ x 32″) basks in warm light, next to works by his equally masterful peers at the Essie Green Galleries. Edmiston utilizes the Essie Green Galleries collection to enlighten others of the profound history associated with the works, and to offer choices. He says, “My job as a dealer is to show buyers that there is more and different pieces than what they have seen.” Yet, Edmiston insists, creating a comfortable environment for buyers to test their own level of curiosity and art awareness without feeling pressure is just as important. Edmiston’s mission is to cultivate the “seeking mind.” He admits that there were more curious art seekers in the ‘60s, ‘70s, and ‘80s, but he remains optimistic about today’s seekers. He focuses much of his energy on establishing ongoing relationships with young clients, helping them to develop a deeper appreciation for African American art and culture. For any business, adequate promotion and exposure are essential for maintaining a burgeoning client base. 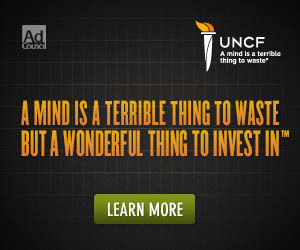 This is especially the case in the art world. Edmiston admits that it is a challenge getting the word out about his unique collection, especially with regards to African Americans who arguably havelimited media outlets. says, “Not many people know much about Black art, that there were Masters who produced work equal to anything by anybody.” By no means, however, does Edmiston discount the white collector. He explains that “the white collector has always been important within the Black cultural scene,” and that such collectors have enabled the Black arts scene to flourish in places like Harlem. Of course quick sales are part of the business, but Edmiston also takes pride in nurturing his clients’ cultural interests, desires, and motivations. Thereby, clients develop confidence, no matter what their art or educational backgrounds may be, when making purchases and building their collections. Edmiston insists that collecting is more so an emotional practice — that collectors often buy works based on the visceral magic they realize when interacting with a piece. Edmiston affirms that such an experience is priceless. Saturday from 11 a.m. to 6 p.m. Contact the gallery by phone at (212) 368-9635, or by website (www.essiegreengalleries.com) for more information.